The RInside package makes it pretty simple and straightforward to embed R, the wonderful statistical programming environment and language, inside of a C++ application. This uses both the robust embedding API provided by R itself, and the higher-level abstractions from our Rcpp package. A number of examples are shown on this blog both here and here as well as on the RInside page; and the source package actually contains well over a dozen complete examples which cover anything from simple examples to parallel use via MPI for parallel computing. Beginning users sometimes ask about how to use RInside inside larger projects. And as I had meant to experiment with embedding inside of the powerful Qt framework anyway, I started to dabble a little. A first result is now in the SVN sources of RInside. The problem I addressed first was actual buildability. For the RInside examples, Romain and I provide a Makefile that just works by making calls to R itself to learn about flags for R, Rcpp and RInside such that all required headers and libraries are found. That is actually relatively straightforward (and documented in our vignettes) but a little intimidating at first---which is why a ready-made Makefile is a good thing. The double dollar signs and escaping of parentheses are a little tedious, but hey it works and expands the compiler and linker flags such that everything . The code itself is pretty straightforward too. We instantiate the RInside object as well as the main Qt application object. We then instantiate a new object of class QtDensity that will launch the main widget; it is given a reference to the RInside object. The definition of the main object is pretty simple: a few private variables, and a few functions to interact with the GUI and get values from the radio buttons, slider or input field---as well as functions to update the chart or re-draw the random variables. Lastly, no big magic in the code either (apart from the standard magic provided by RInside). A bit of standard GUI layouting, and then some functions to pick values from the inputs as well as to compute / update the output. One issue is worth mentioning. The screenshot and code show the second version of this little application. I built a first one using a standard portable network graphics (png) file. That was fine, but not crisp as png is a pixel format so I went back and experimented with scalable vector graphics (svg) instead. One can create svg output with R in a number of ways, one of which is the cairoDevice package by Michael Lawrence (who also wrote RGtk2 and good chunks of Ggobi). Now, it turns out that Qt displays the so-called SVG tiny standard whereas R creates a fuller SVG format. Some discussion with Michael reveals that one can modify the svg file suitably (which is what the function filterFile below does) and it all works. Well: almost. There is a bug (and Michael thinks it is the SVG rendering) in which the density estimate does not get clipped to the plotting region. std::string cmd1 = "Cairo(width=6,height=6,pointsize=10,surface='svg',filename=tfile); "
What the little application does is actually somewhat neat for the few lines. One key features is that the generated data can be specified directly by an R expression which allows for mixtures (as shown, and as is the default). With that it easy to see how many points are needed in the second hump to make the estimate multi-modal, and how much of a distance between both centers is needed and so on. 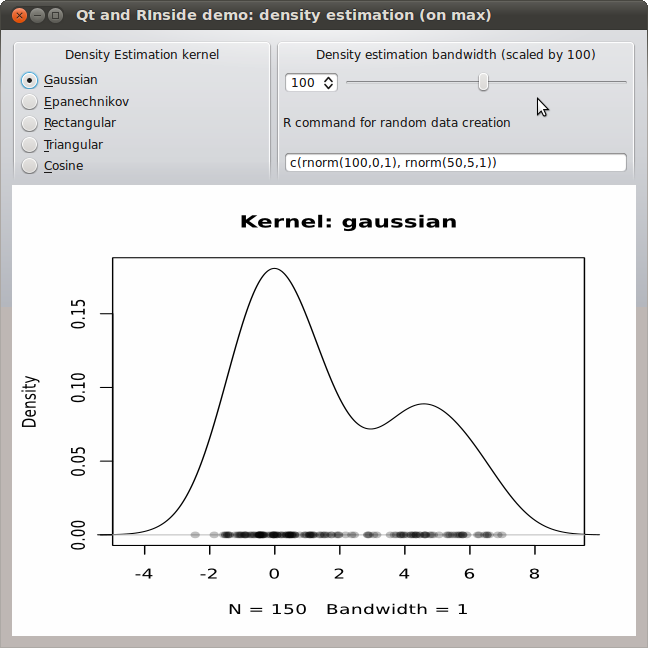 Obviously, the effect of the chosen kernel and bandwidth can also be visualized. And with the chart the being a support vector graphics display, we can resize and scale at will and it still looks crisp. The code (for both the simpler png variant and the svg version shown here) is in the SVN repository for RInside and will be in the next release. Special thanks to Michael Lawrence for patiently working through some svg woes with me over a few emails. Update 2: Two URLs corrected.